Ginger was known since ancient times not only in Asia, but in the Eastern Mediterranean coast; its mention in the text of the Quran means that it was known to Muslim cultures by the 600s C.E. It was also one of the earliest spices known in Europe, already praised by the Greek and Roman empires. Its use in baked goods is documented in France since the ninth century, which extended along all of Northern Europe as digestive aids and shaped in different forms to convey messages. In England, both Henry VIII and Elizabeth I were known to favour ginger; the first for medicinal applications and the latter, as a feature in the lavish sweet spreads offered in her court. Ginger became so popular that it was used as a condiment to add to food at the table. By the nineteenth century, pubs and taverns in England would put out small bowls of ground ginger, for people to sprinkle into their beer and get a whiff of the fresh spice in their drink, which was probably the origin of the name ginger-ale. It is not surprising then that the first non-alcoholic ginger flavoured beverages were developed in Ireland and England, sometime in the 1840s; although probably nothing more than sweetened water with ginger at first, they became nevertheless very popular as tonics and refreshments. Just a few years later, ginger-ales and ginger-waters had made their way to the US East coast, sometimes called “switchels”, and shortly after the American Civil war, pharmacist James Vernor invented “golden ginger-ale”, allegedly from a barrel of ginger water left behind in Detroit just before he joined the Union Army, which upon his return in 1866 had transformed in a “deliciously different” fermented non-alcoholic beverage. The Ginger Limeade pictured at the top of this post, is my take on a homemade Canada-Dry-like beverage, with added Mexican flavours from agave syrup as sweetener and lime juice to give it a slight acidity (in lieu of fermentation). Dissolve sweetener in water; add freshly squeezed juice from one half of the lime, and ginger, stirring until well dispersed. Just before serving, top with soda water and add ice cubes and a wedge from the other half of the lime. I still see my version as a humble improvement, though, because I am guessing that Ma probably only had ground ginger available, so grated fresh ginger and lime juice sure must taste crispier and better than dry ginger and vinegar. At any rate, my ginger limeade was just as described by Laura, very refreshing and yet, somehow, warm in the belly. I am joining What’s for Dinner? 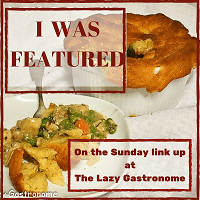 Sunday Link-up # 171 graciously hosted by Helen @ The Lazy Gastronome. Interesting history on ginger ale. With the surge of micro-breweries and cideries, maybe we can hope that someone will try a new spin on ginger ale! Yum on the recipe. In MI we get Canada Dry ginger ale and it’s my favorite one on the market. Always happy when someone finds them interesting, thank you! Wonderful, I hope you enjoy it, Mel! Thanks for sharing the history and the recipe. Absolutely, even sugar; I imagine Laura Ingalls meant molasses or other sweetener. Wow – this sounds really delicious and refreshing! Thanks for sharing at the What’s for Dinner party – and have a wonderful week. Hope we see you next Sunday too! Thank you, Helen! Have a great week, until next Sunday! Interesting history!! And I like the tie-in to Wilder as well. I read all her Little House books a couple years ago after visiting a couple of sites dedicated to the Ingalls history. Never read them as a kid. The drink sounds yummy. I loved ginger ale as a kid. I also watched the TV show. I prefer Canada Dry, myself.